National Conference of Catechetical Leadership Executive Director, Margaret Matijasevic, and Catholic Apostolate Center Director, Fr. Frank Donio, S.A.C., in a conversation about catechists as Missionary Disciples. "Evangelization at the margins drives USCCB convocation planning" - Interview segment with Director, Fr. Frank Donio, S.A.C. Episode 17: New Evangelization - Who is evangelized? 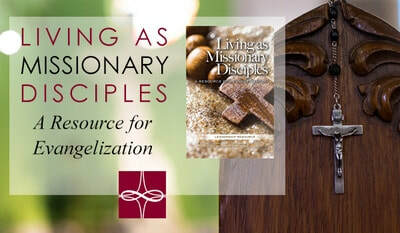 Visit our Living as Missionary Disciples resource page to learn more about the USCCB document that was introduced at the Convocation. The Catholic Apostolate Center contributed to the creation and drafting of the resource. Learn more about our consulting services which can help you implement these ideas and strategies into your ministry or parish. Recording of Facebook Live presentation of Living as Missionary Disciples in a Challenging World with Center Director, Fr. Frank Donio, S.A.C. ​Missionary discipleship is a key theme for Pope Francis in his addresses to Christians and in his visit to the United States in September for the World Meeting of Families. Join Dr. Susan Timoney and Don McCrabb in this presentation where they discuss the New Evangelization as a way of ongoing Church and personal renewal that can result in vibrant parishes with all the baptized living as missionary disciples. Dr. Timoney is the Secretary for Pastoral Ministry and Social Concerns at the Archdiocese of Washington, Dr. Timoney coordinates evangelization initiatives and pastoral planning for archdiocesan parishes. Dr. Donald R. McCrabb is a pastoral theologian serving the homeless and unemployed. He has served the Church in campus ministry, ministerial and leadership formation, organizational development and advancement. Pope Francis has called Blessed Pope Paul VI’s Document on Evangelization, Evangelii Nuntiandi “the greatest pastoral document that has ever been written.” As we celebrate its 40 year anniversary Jonathan will unpack key themes and discuss how it continues to provide practical insights into our call to be evangelizers in the Digital Age. On March 2, 2017, Director Fr. Frank Donio, S.A.C. and Center Advisor & Secretary of Pastoral Ministry and Social Concerns, Archdiocese of Washington, Dr. Susan Timoney, talk about practical ways to live as a missionary disciple in the spirit of prayer, fasting, and almsgiving.